Prime Minister Zoran Zaev’s frequent references to his country as Macedonia instead of North Macedonia, as provided in the recently approved Prespa Agreement, has stirred concern among the many critics of the agreement in Greece. 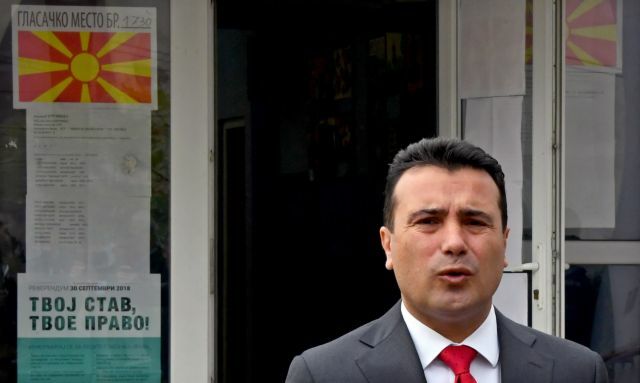 “With the Prespa Agreement, Greece accepted the right of self-identification and that no one any longer can deny our right to be Macedonians who speak the Macedonian language in this land,” Zaev said in an interview with a Bosnian television station. That and other similar comments by Zaev have fueled criticism that the agreement permits Skopje to interpret it as it sees fit. Zaev said that he negotiated with Greece without the ethnic identity of Macedonians who speak Macedonian and have their own tradition and history being disputed. He said he was proud that he leads a country “for which our forbears fought and no one can deny that”. In the note verbale it sent to Athens after amending its Constitution, Skopje said that the constitutional amendments passed by parliament – which include the country’s new name - will come into effect only after the Greek Parliament ratifies the protocol approving the country’s admission to Nato as Republic of North Macedonia. Greek government spokesman Dimitris Tzanakopoulos stated that formally Zaev is for the time being within his rights in calling his country plain Macedonia. The Nato Protocol will be approved by the Greek Parliament in the next few days. The German Bundestag yesterday became the first legislature of a Nato member-state to ratify the protocol. Zaev stressed that the Prespa Agreement was the result of persistent efforts by both countries with great support from the US and the EU. He attributed Russia’s vehement opposition to the agreement to the fact that Moscow does not want his country to become a Nato member. “We want a good relationship with Russia. We understand its stance, but above all is the fact that 80 percent of Macedonians want the country to become a member of Nato and that must be respected,” he said. “Formally, Zoran Zaev has the right to use the name Macedonia and not North Macedonia,” the Greek government spokesman told journalists. A largesegment of the Greek press views the continued use of plain Macedonia as evidence that Skopje is liable to purposely misinterpret the terms of the Prespa Accord. Tzanakopoulos said he is absolutely convinced that Zaev “will exhibit good will as he has in the past”.